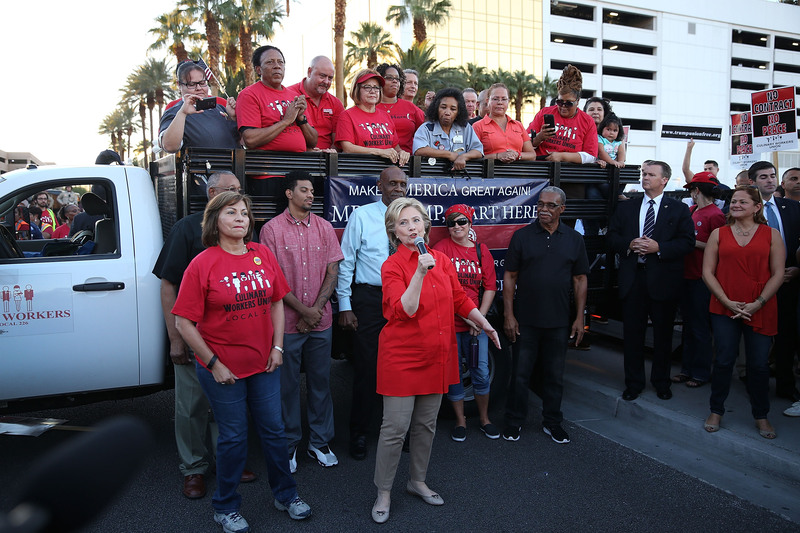 Union protests outside Trump casino provide opportunity for Clinton. Even though Republican front-runner Donald Trump won’t be at Tuesday evening’s Democratic debate in Sin City, he’s managing to create drama there. Outside the towering gold-encrusted Trump International Hotel in Las Vegas on Monday, a crowd of 500 protesters rallied for unionization of the Vegas Strip resort. Chanting “standing up and fighting back” and holding signs that read, “No contract, no peace,” members of the Culinary Workers Union, the largest union in Nevada, sent a message directly at Trump. The timing, on the eve of the first Democratic debate of the 2016 campaign, could not have been more perfect. The Trump hotel and casino is one of the few hotels on the Las Vegas Strip that is not unionized. The strip, in fact, has about a 95 percent union density. For comparison, the Wynn Hotel, which is the location of Tuesday’s debate, is unionized. While the real estate billionaire was in New Hampshire for a campaign event, another presidential candidate was eager to respond to the workers’ pleas — Hillary Clinton. Clinton made a surprise appearance at the rally around 5:30 p.m. to stand with the organizers. For leaders of the Culinary Workers Union, the fact that Trump refuses to unionize his Vegas hotel is only part of the frustration. “He’s fighting the union over there, and at the same time he’s taunting the immigrants in this country and doesn’t care about the contribution the immigrants make in this country,” Arguello-Kline added. While the union has not endorsed a candidate for president in 2016 — it endorsed Barack Obama back in 2008 — Arguello-Kline said an endorsement of Trump is very unlikely. But one for Hillary might have more potential. While Clinton’s appearance Monday was a great headline grabber, it also echoes recent poll numbers that show the candidate strongly ahead in Nevada and with Latino Americans. A CNN poll released Monday found that Clinton has the support of 50 percent of those likely to attend the Democratic caucus in Nevada in February. Immigration could be a deciding factor for many here – according to the Pew Research Center, Nevada has the nation’s largest share (8%) of unauthorized immigrants as a percentage of a state population and the highest share (10%) of unauthorized immigrants in a state labor force. Clinton also has historically performed well with Latino voters. In 2008, Hispanics picked Clinton over then-Sen. Barack Obama by almost two-to-one. And in more recent poll, Clinton is outperforming all other Democratic nominees with non-white voters. In a CNN/ORC poll released in September, Clinton won 55 percent of non-white voters polled. Democratic candidate Bernie Sanders got only 17 percent.